MyChart at GBMC is coming on October 1! At GBMC HealthCare, we’re working to deliver well-coordinated care for you and your family. It doesn’t matter if you're at work, on the road, or at home. With MyChart at GBMC, you will have secure, 24-hour access to your health information. Ready to get started on the road to better health and better care? Ask your physician or other members of your care team about MyChart at GBMC today! Q: Why is a flu vaccine important? A: Influenza is a serious disease that even healthy people can get very sick from and spread to others, often unknowingly. An untreated flu can lead to hospitalization or even death. When more people get vaccinated against the flu, it has less chance of spreading throughout our community. Q: When is "flu season"? A: Flu season in the United States can begin as early as October and last as late as May. This is when flu viruses are circulating at higher levels than other months. A: Mainly, flu viruses are spread when people with the flu cough, sneeze or talk. This produces droplets that can land in others' mouths or noses. Less often, the flu virus can be transmitted by a surface or object that someone with flu has touched. Q: What are the best ways to avoid the flu? A: Get a flu shot! Wash your hands often with soap and water. Do not share linens, eating utensils or dishes with those who are sick. Disinfect frequently-touched surfaces often, especially if someone around you has been ill. Avoid touching your own mouth or nose if you haven't washed your hands first. Q: When is the flu considered contagious? A: It's possible for healthy adults to be contagious and infect other people beginning one day before symptoms develop and for up to five to seven days after becoming sick. Children may be able to infect others for longer than seven days. It is possible to "feel fine" but still spread the flu virus to others. If you or your child is sick, stay home until your doctor tells you it is OK to return to work or school. Q: How quickly will a flu vaccine be effective? A: It doesn't work right away. It takes about two weeks after vaccination for antibodies to develop in the body to protect against influenza. This is why it is best to get vaccinated early in the fall, before flu season is in full swing. Talk to your primary care physician about getting seasonal flu vaccinations for you and everyone in your family who is older than six months of age. If you do not have a primary care physician, visit www.mygbmcdoctor.com to find one who is right for you. To make the parfait, spoon 1 tablespoon of yogurt into the bottom of an 8-ounce glass. Top the yogurt with 1 tablespoon sliced bananas, 1 tablespoon sliced strawberries and ¼ cup graham crackers. 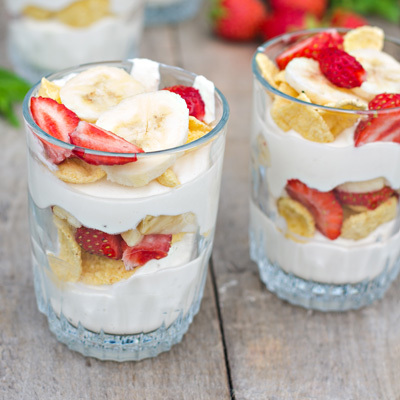 Repeat the yogurt, banana, strawberry and graham cracker layers. Top with a tablespoon of fat-free whipped topping, if desired. Serve the parfait immediately, or cover each glass with plastic wrap and chill for up to 2 hours before serving. Recipe retrieved from http://www.nhlbi.nih.gov/health/educational/wecan/eat-right/yogurt-parfait.htm, provided by the U.S. Department of Health and Human Services.